This paper analyzes the effect of environmental policies on the direction of energy innovation across countries over the period 1990-2012. Our novelty is to use threshold regression models to allow for discontinuities in policy effectiveness depending on a country’s relative competencies in renewable and fossil fuel technologies. We show that the dynamic incentives of environmental policies become effective just above the median level of relative competencies. 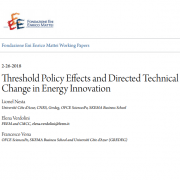 In this critical second regime, market-based policies are moderately effective in promoting renewable innovation, while command-and-control policies depress fossil based innovation. Finally, market-based policies are more effective to consolidate a green comparative advantage in the last regime. We illustrate how our approach can be used for policy design in laggard countries.